The directors of Marlborough Fine Art are delighted to announce the first UK exhibition of paintings by celebrated Chinese artist, Zhang Qikai. It will comprise twenty recent works, many using the image of the Panda, paintings for which he has been highly praised. Born in Sichuan Province in 1950, Qikai has shown extensively in China and Japan and in Germany, where he lived in the 1990s. The apparent loneliness of living in a foreign land and a deep understanding of the differences between east and west are ever present in his work. Having returned to his native China in 2000, he began to use the panda in his work. The panda is a symbol of peace and a protected species in China, yet he cuts a lonely, solitary figure in Qikai’s work. The environment where the panda resides varies but void and quiet are a common characteristic. He is enclosed in the material world and overwhelmed by consumer culture, as if to imply his and China’s predicament with the modern world. There is conflict between what is happening in the real world, the effects of consumerism and the cultural discord within. In this highly civilised world with well-developed science and material, the panda provides spiritual sustenance while human relations are disharmonious. 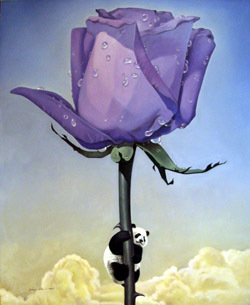 The panda also suggests the desire to escape, such as driving away in a car or clinging to the stem of a rose. There is always a bid for freedom in these dream-like paintings but there is always a sense that we are held back by the constraints of reality. Nice post with many fascinating ideas! Can’t say I completely agree with all you have suggested here, but there are several important recommendations you have emphasized that can be quite usable on natural health and associated topics. Please keep providing more suggestions on this topic and associated subjects, as there are many out there like me who are trying to understand the ups and downs. I used to be very happy to search out this web-site.I wanted to thanks on your time for this excellent learn!! I definitely enjoying every little little bit of it and I have you bookmarked to take a look at new stuff you blog post. Level your abilities up with newly found Powerpack. An insightful blog post right there mate ! Thanks for posting ! I’ve read several just right stuff here. Definitely worth bookmarking for revisiting. I surprise how a lot attempt you set to create any such magnificent informative site.